An organization known for awarding grants to charities hopes to put millions into the city's coffers to help preserve Winnipeg history and build a bridge. The Winnipeg Foundation announced Tuesday it has offered to donate $5 million to the city. The money would go toward the creation of a community archives at the William Avenue Carnegie Library, and a pedestrian and cycling bridge connecting Osborne Village and downtown, said Winnipeg Foundation CEO Rick Frost. Both capital projects are already on the books for the city. Frost hopes the extra cash will bump the bridge and archives up on the list of priorities at city council in advance of the foundation's 100th anniversary in 2021. "They are significant amenities and that's what we were kind of looking for, some that we could move up the queue, as it were, and try to get some public support to try to get these projects," said Frost. "Our vision is a Winnipeg where community life flourishes for all." 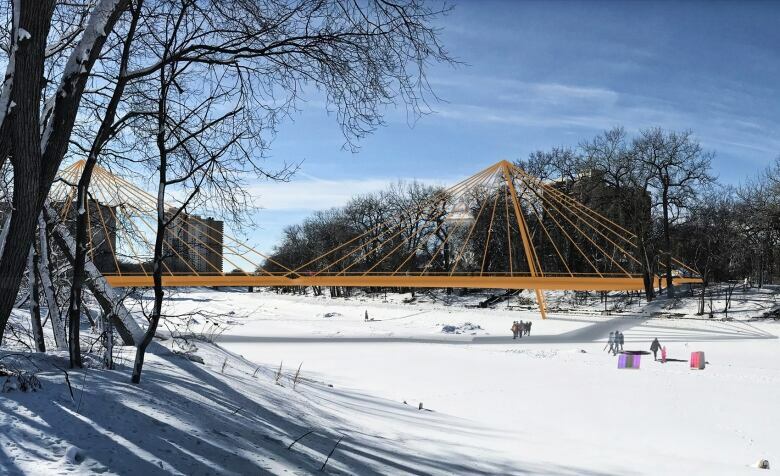 The bridge would stretch between McFayden Park and Fort Rouge Park over the Assiniboine River. And historians have decried the state of the city library and archives and called for upgrades. City archives have been holed up in a former warehouse on Myrtle Street since a 2015 storm damaged the Carnegie Library. "The archives building is in very poor repair," said Frost. "There's been a lot of heritage concern about how do we preserve that building and so we felt that making an investment there would be an appropriate thing to do, recognizing the legacy that we represent in the city." Though the endownment-based organization perhaps isn't best known for awarding funds to infrastructure projects, the foundation gave $6 million to the Canadian Museum for Human Rights. It also contributed $1 million to the city to help complete the Saint-Boniface Belvedere walkway on Tache Avenue that just opened to the public. Frost said the Osborne Village pedestrian bridge would embody some of the same qualities of the Belvedere. "It's a public amenity project joining two neighbourhoods together, it represents more or less a progressive and forward looking city," said Frost. "That's another aspect of what the Winnipeg Foundation is always interested in — the vibrancy of the downtown, green spaces in the downtown are things that we've always put some priority around." The Winnipeg Foundation made financial contributions to 900 organizations in 2018 and expects to issue $140 million in grants and other arrangements in Winnipeg over the next three years, said Frost.